Cabin Creekwood is a fantastic place to stay and breathe the fresh air, relax in a rocking chair, or just enjoy the scenery, but when the kids are getting too antsy and you want to go out for a nice family-friendly adventure, consider Blackjack & Company on a Wednesday evening for some great music and singing. The Shenandoah Valley, absorbing a rich mountain culture from the surrounding Appalachian, Allegheny, and Blue Ridge Mountains, is known for a wide variety of acoustic music. It is not unusual to hear bluegrass, country, or folk music on any radios or at festivals scattered throughout the Valley. These genres are typically played on acoustic stringed instruments. Banjos and guitar, of course, are the most widely associated with bluegrass music, but can also include fiddle, upright bass, and mandolin. Located a short 10 minute drive from Cabin Creekwood in historic downtown Waynesboro, Blackjack & Company is a quaint barbeque and burger restaurant that has something for every taste, from barbeque to shrimp and grits. Every Wednesday night, Blackjack & Company holds an Acoustic Jam Session. Bring your instrument and join in! Happy hour begins at 5:00pm, music begins at 6:00pm. Along with the music and fun, Blackjack & Company will serve food specials such as their burger or pulled pork slider platters, but will also have their regular menu available to choose from. 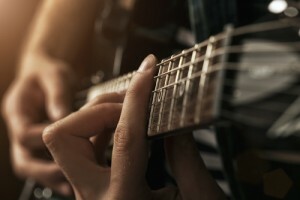 So if you are staying with us at Cabin Creekwood, we recommend taking a short trip to Waynesboro, Virginia on a warm Wednesday night for a fun, finger lickin’, guitar pickin’ time at the Acoustic Jam Sessions at Blackjack & Company.